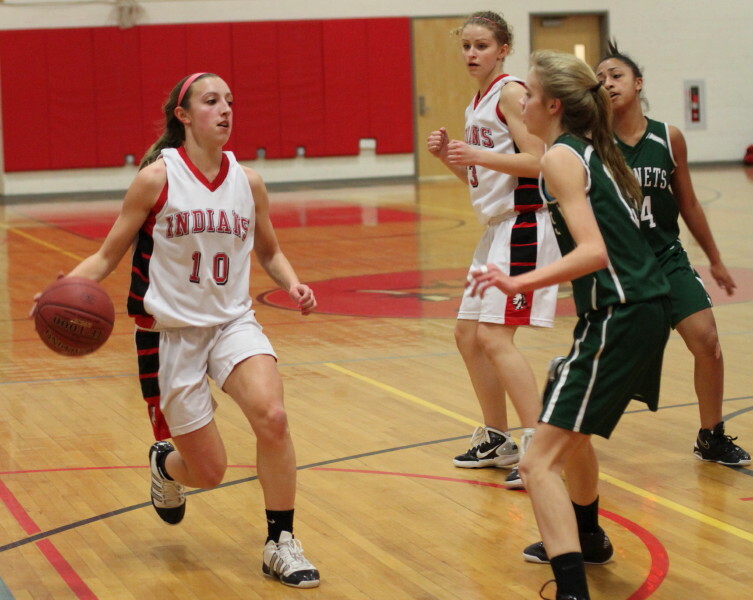 (Amesbury) The Amesbury Indians jumped on Manchester-Essex early and defeated the Hornets, 56-31, on Tuesday night in Cape Ann League play. It was obvious right off that the Hornets would have trouble with full-court pressure. In the first two minutes the Indians forced turnovers and earned breakaways as they zipped ahead, 6-0. Jumpers from Maya Heath and Carolyn Heslop steadied things temporarily (11-6) with 2 ½ minutes to go in the first quarter. 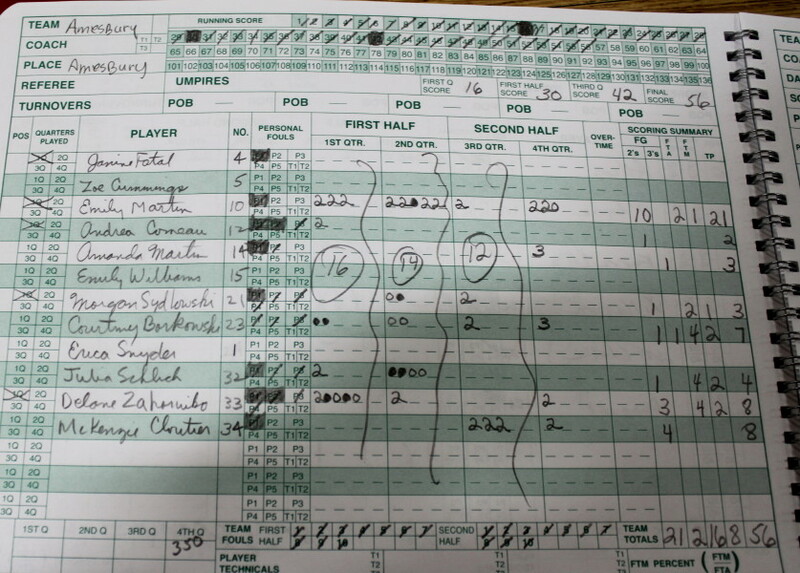 The game got away from ME during the next six minutes as Amesbury put together a run of fourteen straight points. 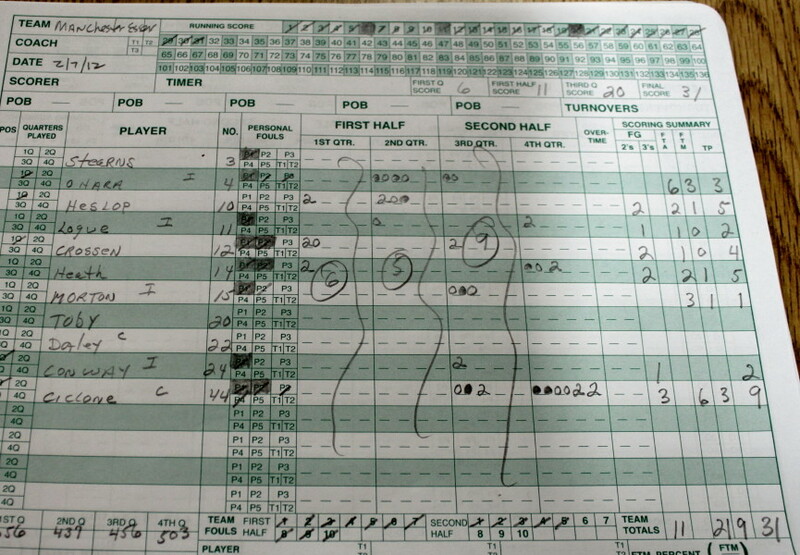 It was a great stretch of offense for the Indians as they made six-of-seven free throws to go along with four layups. They were either scoring or getting fouled. 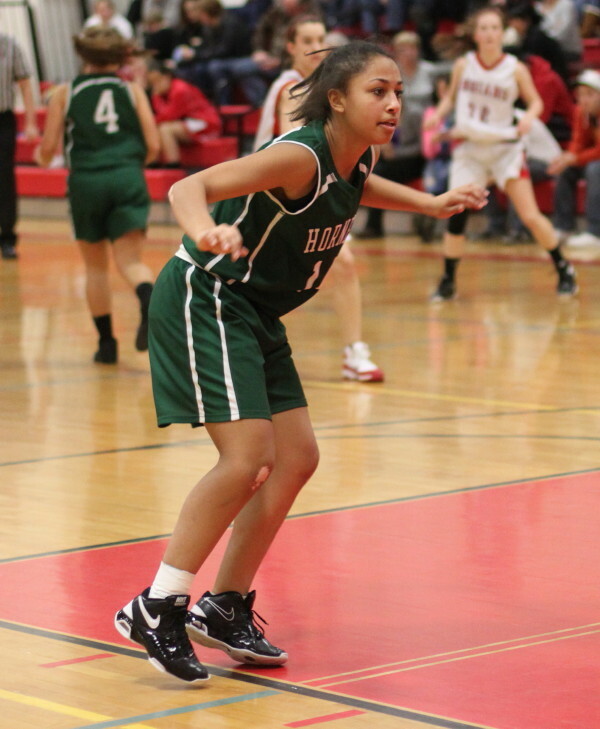 Now down, 25-6, with 4 ½ left in the second quarter, this one had already gotten away from the visitors. ME never got closer than seventeen (32-15) the rest of the way. 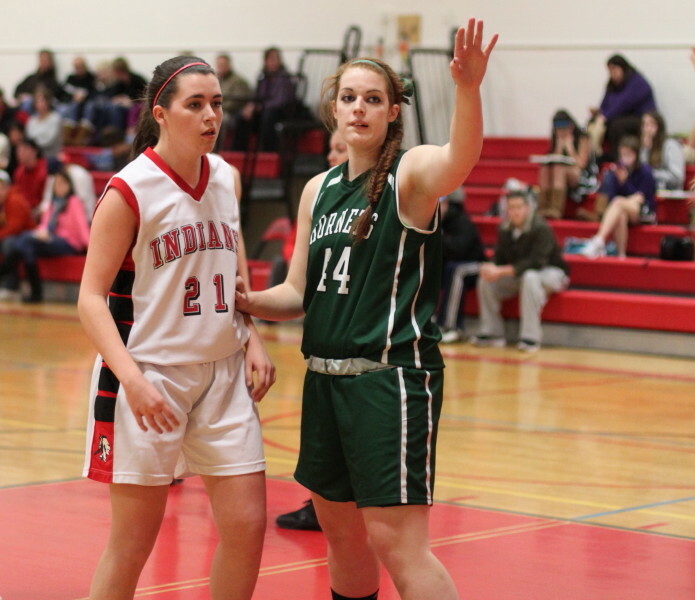 ME trailed, 48-28, late in the game and a couple of three’s (Courtney Borkowski and Amanda Martin) helped stretch the Indian lead at the end to 56-31. 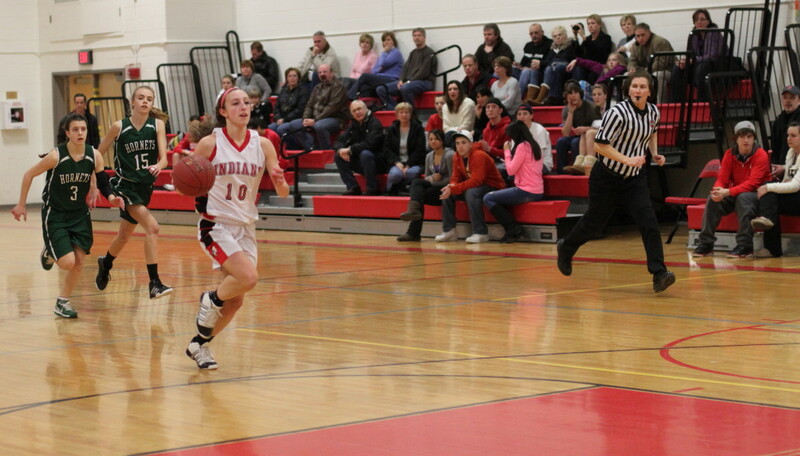 Junior Emily Martin (21 points) had an evening of steals and layups. 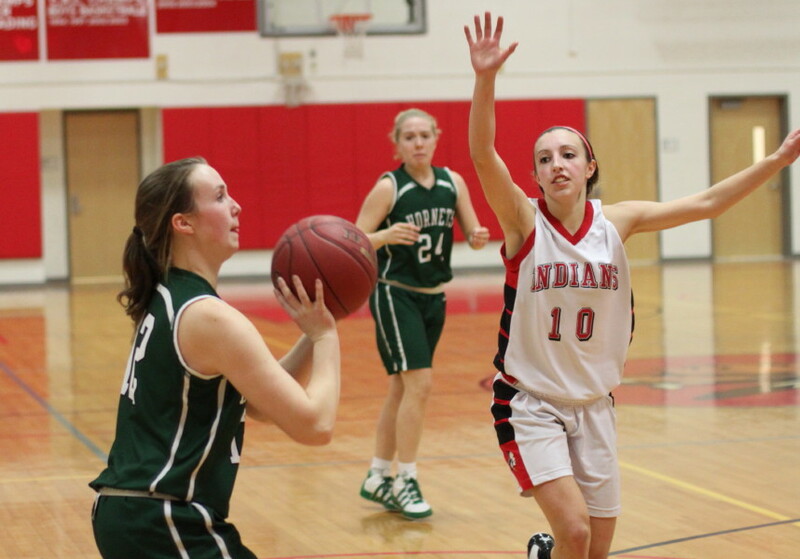 She had thirteen of Amesbury’s first twenty-five points as this game was being put out of reach. After a first half of fifteen points, the ME coaching staff kept reminding the team in the second half to, “keep her (Emily Martin) from going right.” It paid off as Emily had just three layups (going to her right) in the second half. 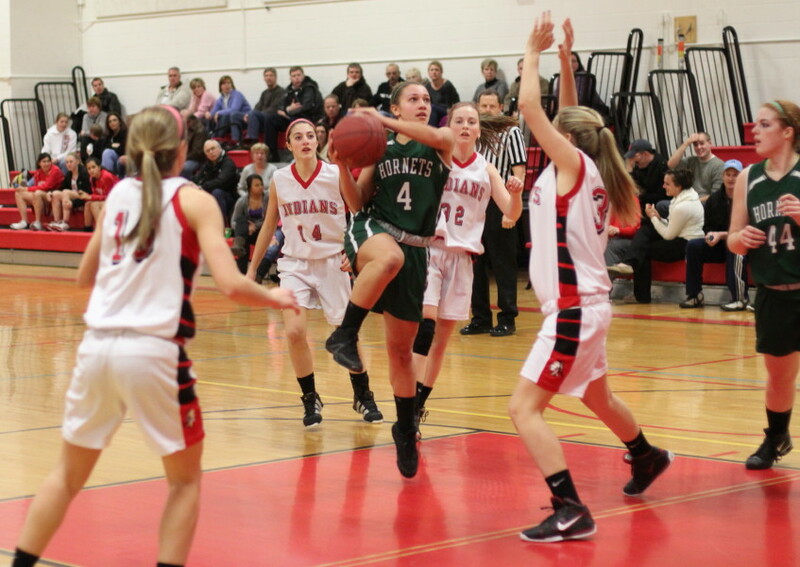 Leanne Ciccone (9 points) showed that she could take the ball to the basket. 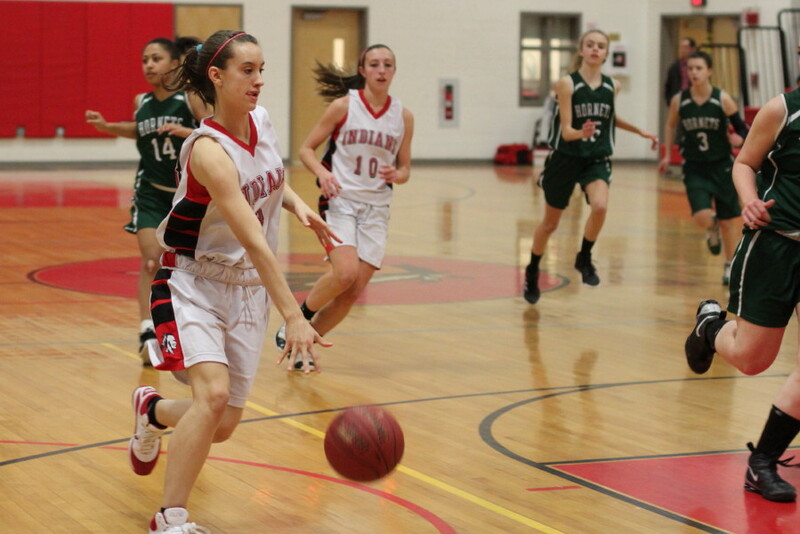 The Indian defense, however, made it a challenge to get the ball in close to the senior. 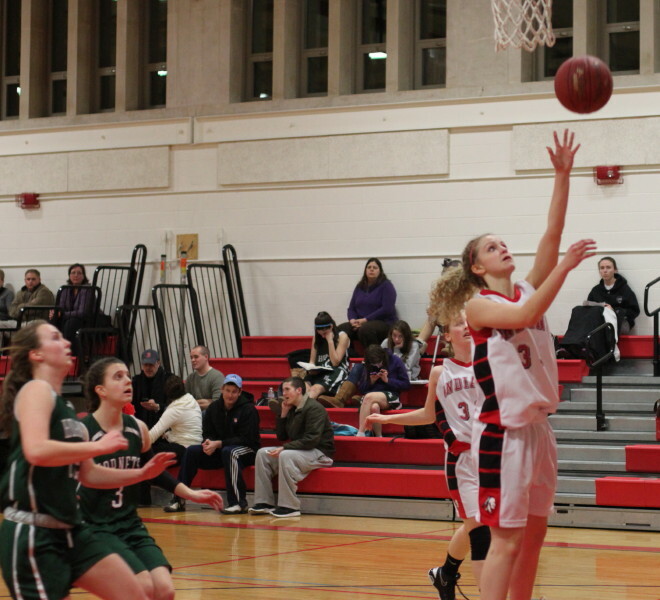 Delane Zahoruiko and McKenzie Cloutier each had eight points for Amesbury. Freshmen played a lot. Amesbury used Amanda Martin, Julia Schlich, and McKenzie Cloutier. ME used Eliza Lougue, Maya Heath, and Fraley Morton. 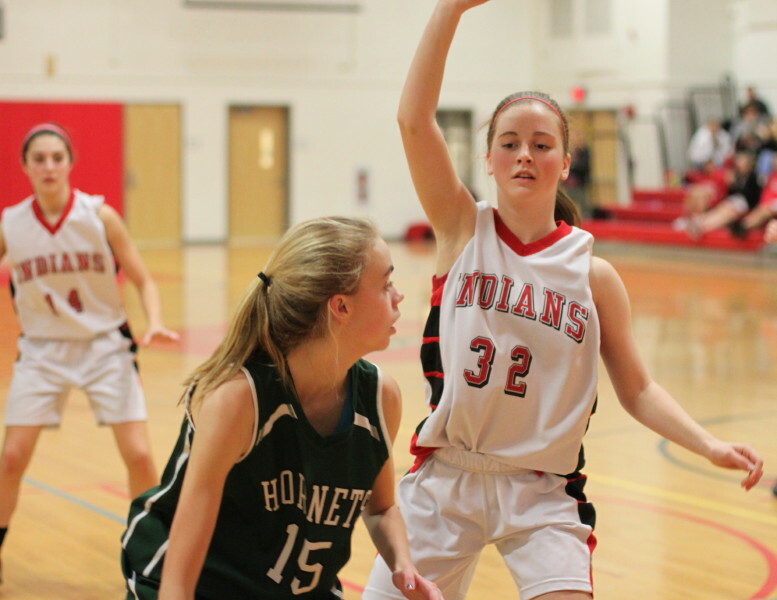 The Hornets had played last night (Monday) in a loss to Hamilton-Wenham. 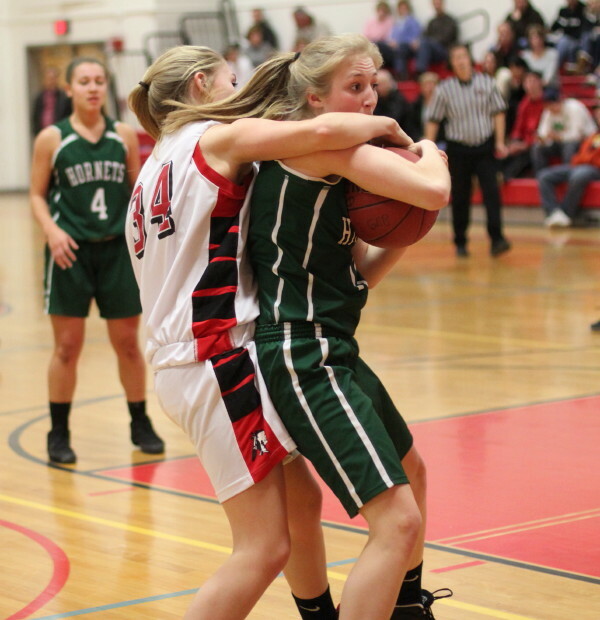 Fatigue may have been a factor in a next-day loss to an aggressive, fast-breaking team like Amesbury. 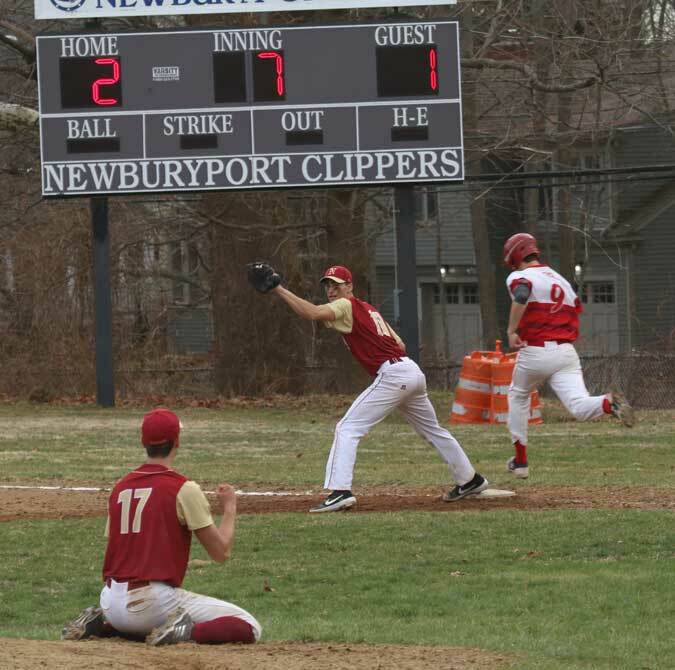 Amesbury (2-6 in Cape Ann League / 4-13 overall) was able to break a four-game losing streak with the victory. Manchester-Essex (1-2 in CAL / 4-13 overall) has now dropped seven straight and ten of their last eleven. But, because of the Sullivan Rule, the Hornets can make the MIAA post-season tournament with a win at home against Rockport on February 16th. You’ve got to like their chances – they defeated Rockport, 57-26, at Rockport earlier in the season.